Okay, so you’re on a cycling holiday… but you are not just an observer; in fact you’re playing a role in the environmental, local and social development in the region you are visiting. 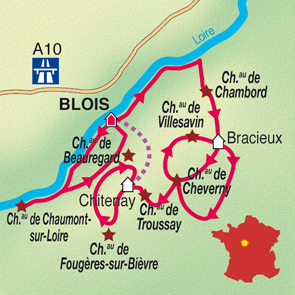 Consider this: during your journey, you set out to encounter the Châteaux de la Loire by using a means of transport - a bicycle - which is among the most ecological that exist. You will cycle along specifically and safely designed itineraries created by the regional authorities to promote soft transport that reduces the carbon footprint of tourism. And all along the way, you will enjoy the numerous forest domains you ride through, always close to nature, yet at the same time learning and understanding much more about the historical environment. In our very own office we have developed software which considerably reduces power consumption and paper use. We work with the company that specialises in recycling old computers and cartridges at the end of their usefulness. We ourselves are a small family travel agency maintaining a close relationship with all our working partners. That’s one of the reasons our holidaymakers are welcomed so warmly and in such a personal way throughout their stay. In each region, local people have got to know us, which is one of the factors that ensures that each holiday is a rich and unique experience.